Well my giant COMC order has arrived. Pretty quick for a Black Friday purchase wouldn't you think? Sadly, I ordered a full week early and thus missed out on what would have likely been a few discounted cards. But the gang at COMC was really great and refunded me the shipping discount they provided. Add to that the fact that the cards themselves were all pretty decent prices and I really can't complain. What I'm really excited about though is the plethora of #WalletCard cardboard I can cross off the list. Twelve cards in total....without question the biggest Oscar haul I've had since I started collecting him. So let's cut the chit chat and get to some pics. I was teetering a bit back and forth on this low-numbered parallel. I guess $7 ended up being a tipping point for me. But since I needed to get to 20 cards for my free shipping I thought what the heck. Glad to have it but I wouldn't be surprised if I find the next one that pops up to be a little cheaper. What really catches my eye is how the gold lettering and band at the bottom just give the photo some warmth that the silver does not have. Weird. 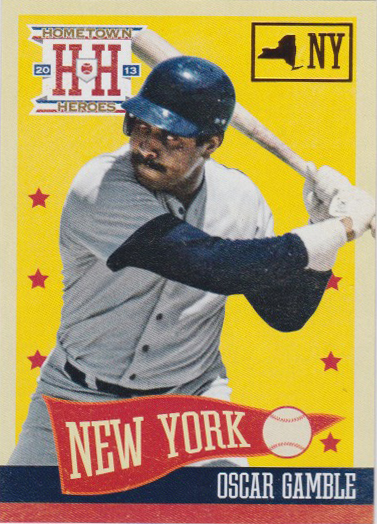 It's as if Upper Deck doctored the gold version to bring out the yellows and golds in the photo. 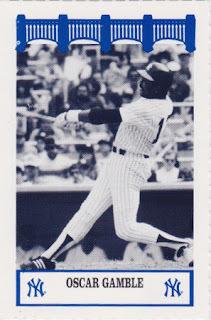 This was a neat card to pull out of the envelope. It's the spitting image of it's smaller 2.5x3.5 counterpart say for the serial numbering in the bottom left. 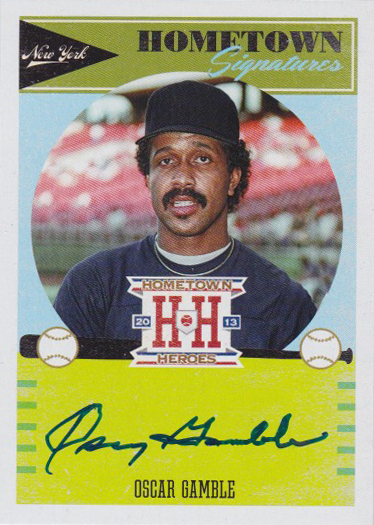 Released as an online exclusive through the Topps website, I was a little concerned at first how quickly these would get snatched up and then never see the light of day. My nerves were calmed pretty quick as these can be found pretty easily on the secondary market. Even the gold version (limited to just 10 copies) has a couple auctions up on eBay. I'm just waiting for the price to come down even more. This base version of the Boys Of Summer signature will go nicely with the Gold (/25) and Red (/10) versions I have already picked up. With there being 125 copies of this card out there I wasn't really in a rush to pick this one up. Again, the COMC sale had me grabbing a couple cheapies to fill out my order. I'll admit, I'm a sucker for these buyback cards. I have no idea why (and it goes against my hatred of them for my Linden collection). 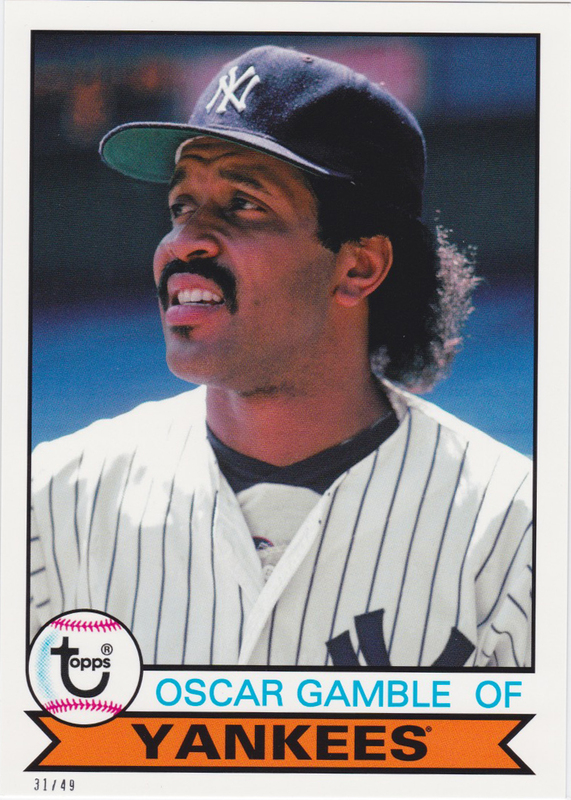 Maybe the market hasn't been oversaturated with Oscar buybacks yet. I love this photo. What a great half-fro. Second verse, same as the first. This one caps off an 11-card buyback party. 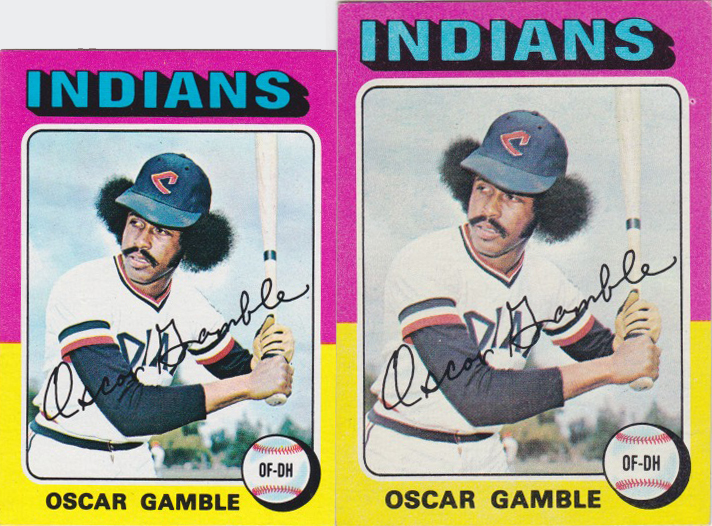 I now own a copy of every Oscar Gamble buyback I've actually seen. I'm sure there are others out there, but they don't go on the list until I've actually seen a copy of it. 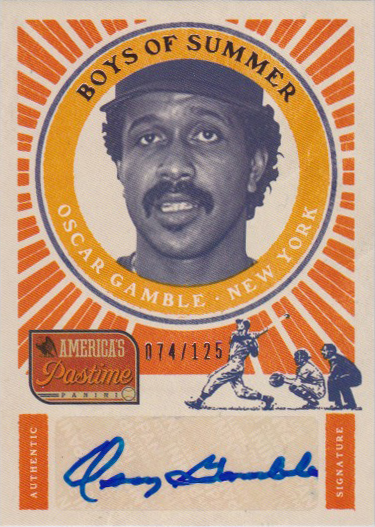 Sticker auto. Cheap. That's about it. 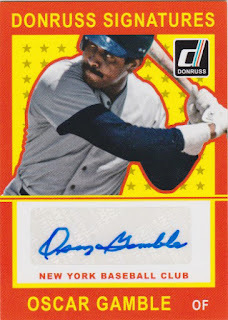 This card truly finishes off the auto rainbow from this set. As many of you know, I recently picked up the black 1/1 card (my first 1/1 #WalletCard) and so I felt the need to complete the triple. Another inexpensive signature card (less than $3) so it was a no-brainer. 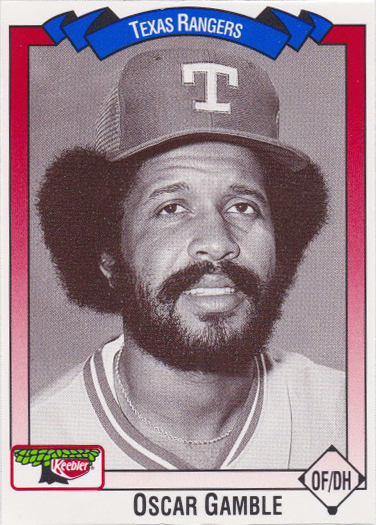 I'm not presenting these in any particular order, but this one might have the nicest afro. Too bad the photo isn't in color as that would've just added to the awesomeness. I take that back....THIS is the best Oscar afro of the lot. What a great card design. 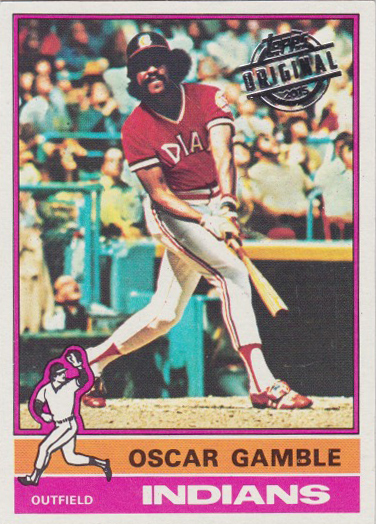 The 1975 Topps might be one of my favourites. The crazy colours and the throwback photos. Terrific. And the mini is in fantastic condition. I couldn't believe it when I took it out of the penny sleeve. 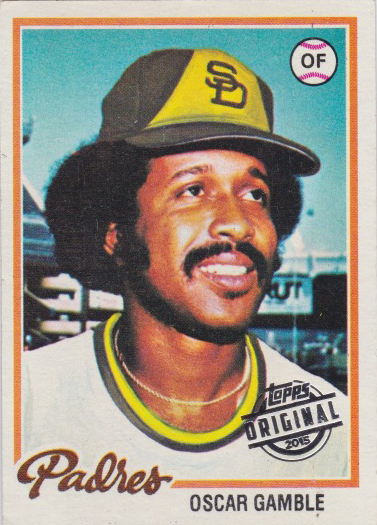 Incredible to think it's a 40-year-old card. It took me a while to clue in to what the "State" and "Zip Code" cards were from this set. There's nothing more than foil stamps indicating the player's state and zip code (fancy that). Made this 0.70 cent purchase an easy one. This was another one of those "let's just pick this up to get my order to 20 cards". 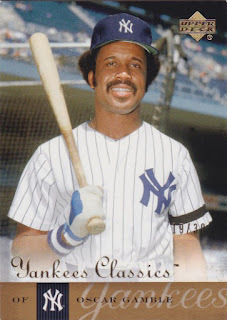 It goes well with my Yankees WIZ 80's card I picked up earlier in the year. 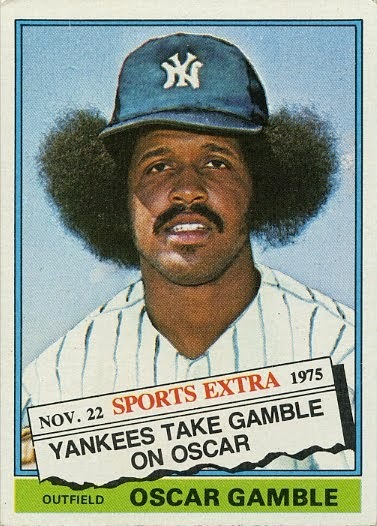 Well, that's all the Oscar Gamble goodness I've got to share for now. I'm really pleased with how the collection is growing - and it's not costing me an arm and a leg. One of the best hobby decisions I've made in a long time. Now....time to check COMC for any new adds. Nice little haul here. The fro is popping - and that 75 Topps Mini is razor sharp!